One of the most important parts of playing receivers is the ability to make and get out of cuts. At lower levels many receivers struggle to make hard cuts off their outside foot. As a result their routes are not as sharp which gives the defender a chance to make a play on the ball. To work on the athlete’s ability to make hard cuts off their outside foot we use Line Drills. Line Drills are very easy and can be run with as many lines as you need. The players start by aligning on the sideline on one of the five yard lines. We do Line Drills right after we work Stance and Starts so players are already on the yard lines. They will start the drill on the simulated movement of the ball (which is normally the coaches hand or hat). When the players go they run down the line at around 75% speed. On every third step they will take a hard cut step off the line until they get to the near hash. There a few key coaching points with this drill. First, it’s critical that receivers do not take a false step coming off the line. They must gain ground on their first step. The major coaching point is to get players to keep their center of gravity over the line. The goal is to stay on the line and only get their foot off the line. The other key coaching point is to make hard contact with the ground. The plant foot must strike the ground each time they go to plant off of it. This helps the players get used to cutting of their outside foot. The other line drill we use requires cones spaced roughly three yards apart and at 135 degree angles. On this drill the players will build on the previous drill where they worked on the initial step. Here the players will make their cut step and then work on taking the step out of the break. To do the drill players will plant off their outside foot directly in front of the cone and then move onto the next cone. This is a drill that is done at about 50% speed so players can master the footwork. In this drill players are getting 10 (or however many cones there are) breaks in a short amount of time. This saves their legs and lets them work on the technique of their breaks. The coaching points in this drill are very similar to the coaching points on the Line Drill. 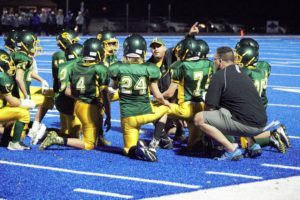 The Coach wants to ensure that the players are planting off their outside foot and then immediately getting into the second part of their route. This is important in route running because it allows the receiver to not only make the break, but also create space between him and the defender. The most critical component of running a great route is making a great break. The advantage the receiver has over the defensive back is that the receiver knows where he is going and the defensive back must react to the route. The goal of a great route is to leverage this advantage by accelerating out of the breaks.